As outlined in the Ski Holidays and Winter sections of this website, there are many ways of enjoying a variety of uniquely-Swiss sporting experiences as a spectator without taking to the slopes yourself, whether watching the skiers in Wengen or the jockeys in St Moritz. Alternatively, you might fancy some ice-climbing or mountaineering. However, we only recommend you consider this with the assistance of local experts and highly-qualified guides. Likewise, in the summer months, when the snows have cleared, there are plenty of great golf courses that welcome visitors – but beware, when playing that decisive shot, as the breath-taking natural surroundings can prove quite distracting. Obviously, skiing, snowboarding, walking, and mountain-biking are the staples that are available around every resort around the country, but in summer many of the lakes offer great opportunities for sailing, wind-surfing, paddle-boarding and swimming. For the more adventurous mountain-lovers, many of the resorts have their alpine schools, where their local expert guides will look after you on climbs, mountain tours, or canyoning. Sports enthusiasts should also take the opportunity of a visit to Lausanne to spend a morning or afternoon surrounding themselves in Olympic memories in the official International Olympic Committee Museum overlooking Lac Leman (Lake Geneva). Since Baron Pierre de Coubertin came up with the idea of resurrecting the ancient Greek festival of sports, the Olympic Games, and restaging it in Athens in 1896, Lausanne has played host to the International Olympic Committee’s headquarters at the Chateau de Vidy on the outskirts of the city, and the Olympic Museum is a natural extension of this. With incredible displays of memorabilia, medals, equipment and unique archive film-footage, you are immediately transported back to Winter and Summer Olympic Games passed, and are reminded of performances and athletes whose names and reputations have gone down in history. Your pleasures and interests don’t all have to be strenuous ones, although quite a few will involve some walking in the mountains, for example, searching out and photographing stunning alpine flowers, bird-watching, looking for the elusive chamois, or trying to spot the adorable marmots – you’re likely to hear them first, and when you do, you’ll understand why they are known as ‘whistlers’ in North America. 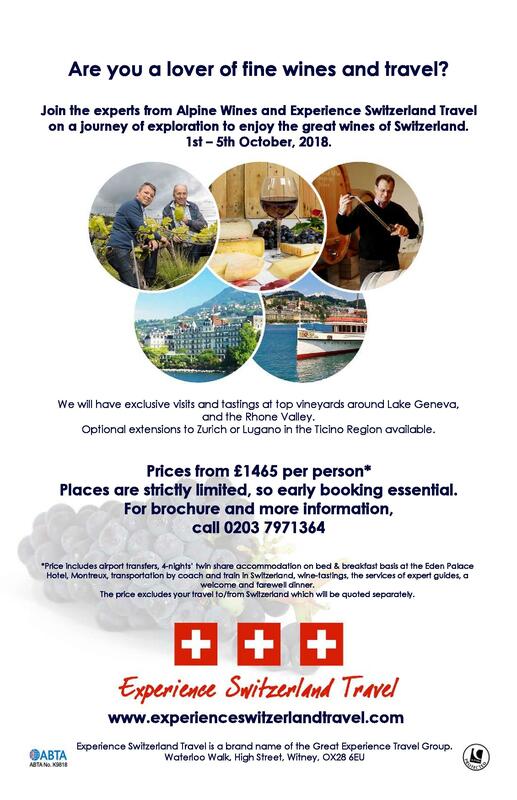 If your particular interests steer you in a more culinary direction, Switzerland has many great sweet and savoury specialities with which to tempt you, and some of the hotels in Zurich offer cookery courses, which will help you to do justice to the great delicacies of Swiss cuisine. And, of course, then there is chocolate and cheese! Many of the famous chocolatiers offer courses to show off their skills, and in the mountains, many of the artisanal cheese-makers will welcome you into their huts to see them making their particularly delicious Bergkäse, the taste of which varies from valley to valley, dependent upon the unique mix grass and flowers upon which the cattle will have fed themselves during the summer months. Switzerland has a small, but highly-respected, wine culture, with many grape-growing areas focused around the mineral rich soils of Lac Leman (Lake Geneva) through to Neuchatel in one direction, and along the Rhone Valley from Martigny through to Visp in the other. Many produce the uniquely Swiss 'fendant' style of slightly-fizzy white wines. Further south, the almost tropical climate of the Ticino region produces many other great wines including wonderful rich reds and refreshing roses. Many growers offer vineyard visits and tastings. For art lovers, Zurich and Geneva both have wonderful galleries, and no visit to Bern should be considered without allowing time to visit the famous Paul Klee Gallery, where you can while away many hours looking at beautiful paintings of probably Switzerland’s most well-known artists. However, it is not just the galleries themselves that contain astonishing artistic creations. The stunningly-beautiful stained-glass windows of Chagal and Giacometti make a visit to Zurich’s Fraumünster Church on the banks of the River Limmat an unmissable experience. And, to show that it is not just canvas and glass that can be used for the creation of artistic masterpieces, the wood-carvers of Brienz, near Interlaken, have a world-wide reputation for their skill and dexterity. If your interests lie in the sphere of music, great concerts – indoors and out – abound, and of course, Montreux, about 60 minutes’ by train from Geneva is synonymous with jazz from its annual Jazz Festival. It’s obviously amazing to see some of the true jazz ‘Greats’ perform, but Montreux comes alive with performances from those that aspire to greatness in years to come, or who are just starting out on their musical career journeys. Whatever your passion or special interest – whether sporting, musical, artistic, culinary, cultural or simply enjoying the scenery – Switzerland has something for everyone. Click here to download a pdf of our special wine tours brochure.